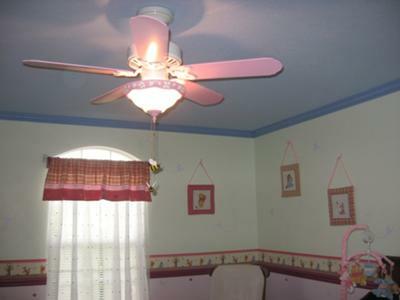 Our classic Winnie the Pooh nursery theme features a sky blue ceiling with clouds and our baby girl's pink ceiling fan. The Winnie the Pooh English Garden Nursery that we designed for our baby girl took us about a month to complete since we had to paint the walls first and then decorate. My husband was amazing throughout the project and took care of all the large areas that needed to be painted and all of the building projects. 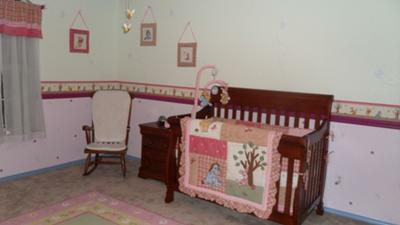 I took care of painting all of the details like painting the butterflies, flowers, and twigs on the baby's walls. 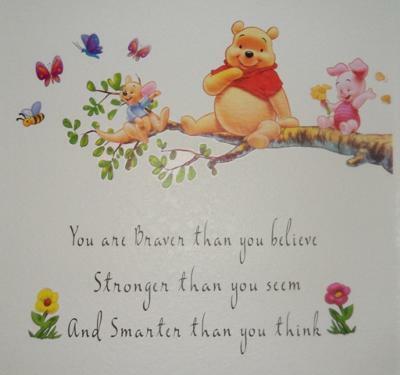 From there, we made sure that one of the nursery walls had our favorite quote from Christopher Robin to Winnie the Pooh that said "You are braver than you believe, stronger than you seem and smarter than you think." With this inspirational quote on display in her room, when she gets old enough, it will be the first thing our daughter sees when she wakes up every morning and she will know that she can do anything! Our DIY nursery project took us awhile to complete but after the painting and decorating is all done, we are very pleased with how everything looks and hope that all of you here at Unique Baby Gear Ideas like our classic Winnie the Pooh baby nursery ideas enough to try some of the DIY, painting and craft ideas in your own project. The Winnie the Pooh books are my favorites and I wanted this theme so badly for our firstborn. Then, I learned that we are expecting a girl and I didn't think it would work. 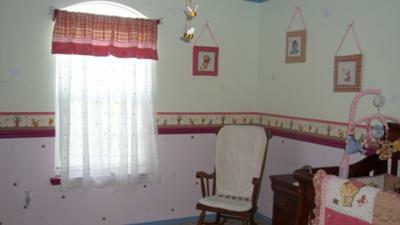 I had no hope until I saw how you decorated your daughter's room. Thanks so much for the sharing your combination Classic Pooh and English garden decorating ideas. I love this garden winnie the pooh nursery i love the characters this is very creative my favorite. Good Luck on winning the contest!! I watched this nursery going through its phases, and it really looks like a professional job. I see this beautiful room and all I can feel is love! So lovely! I think the garden nursery is a perfect room for a girl it has room to grow with her through the years. Join in and write your own page! It's easy to do. How? Simply click here to return to WINNIE THE POOH NURSERY IDEAS.